Have you ever asked yourself why Wes was so happy when you watch him on recordings like this? Watching Wes on the video, you get the impression that he knows the guitar so well, that he barely needs to worry about it. He’s in that special zone that’s the ultimate aim for any jazz guitarist: effortless mastery, which facilitates complete musical spontaneity. I think that’s why Wes was so dang cheerful on stage. How could you not be, being able to play like that?? The answer, my friend, might not be what you expect. By building your repertoire of jazz tunes. This is something that’s sadly neglected by so many aspiring jazz guitarists, and it’s why they are frustrated and falling flat with their playing. You need to learn as many tunes as you can. The more melodies and harmonies that you store in your consciousness, the more you’re playing improves overall. By learning new jazz melodies, the more attuned you get to the skill of shaping good melodies when you improvise. By learning how to comp the progression to a new standard, the better you’re able to negotiate various key changes. With each new jazz standard you learn, you pick up techniques and ideas you can then apply to all the other tunes you’ve previously learned. Every time you learn a new tune, you’ll experience an increasingly exponential level of improvement. In this scenario, it won’t take very long to overcome your struggles and finally be happy with how you sound. What if I was to tell you that there’s a convenient, speedy way to build your jazz standard set list for guitar, alongside other passionate jazz guitarists from all across the world? 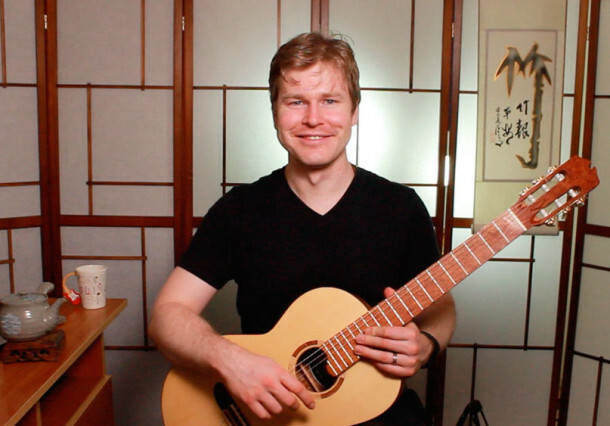 It’s my brand new program, the FretDojo Academy Club. The new Club will feature a convenient all-in-one package of video lessons on a new jazz standard each month, that will show you all aspects of mastering it on guitar in every playing situation. Melody, improvisation, comping, chord melody – the works. Get yourself on the VIP early adopter list for the new FretDojo Academy Club, and I’ll show you the steps you need to take to rapidly build your set list, and walk the fast path towards jazz guitar mastery.